Vegan milk chocoalte eggs: made of 40% Madagascan chocolate with cashew nuts. A truly delicious, very chocolaty and slightly nutty milk chocolate alternative. Contains nuts. 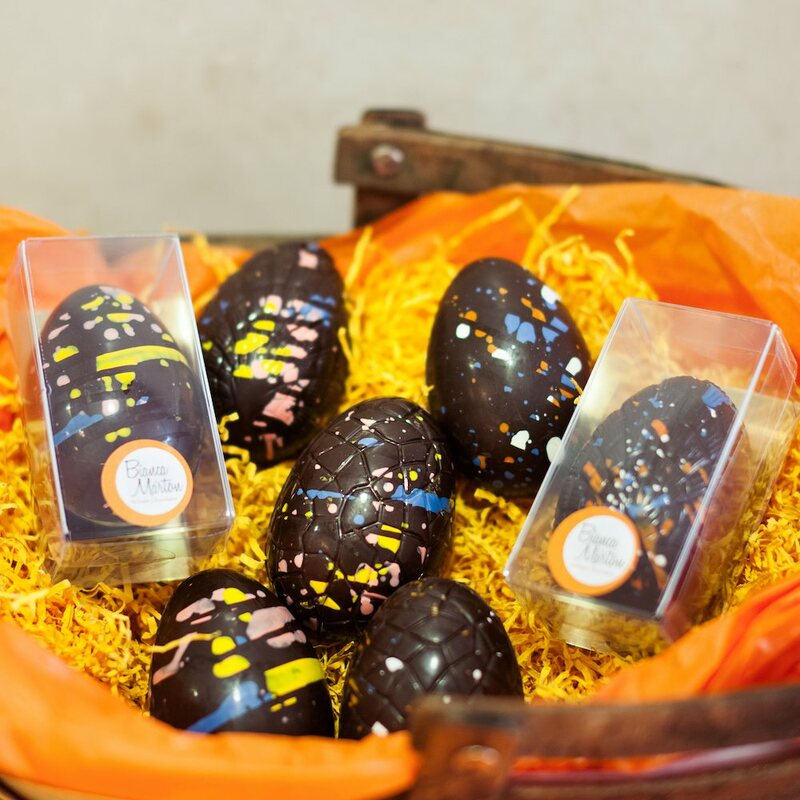 Dark chocolate Vegan Easter eggs: made of 75% single origin Tanzanian dark chocolate. Strong chocolate flavour without being bitter. Delicious and pure. The Easter eggs are individually boxed, and make a delightful present for friends and family. These Easter eggs are individually made, no two are identical. There will be differences in the patterns and shades of colour. 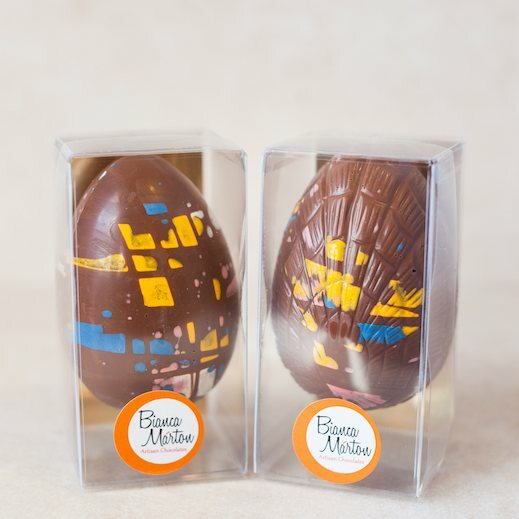 We use a small amount of edible food paint dissolved in cocoa butter to create the decorative finish. Cocoa butter is a native ingredient of chocolate, and contains no dairy. The pictures are indication only, colours, shades and patterns vary on each chocolate box. Chocolates are very well made and have a very natural taste to the flavours. They are beautifully packaged and very presentably decorated. I bought these a present for my Mum and she loved them. Would definitely recommend them to anyone. 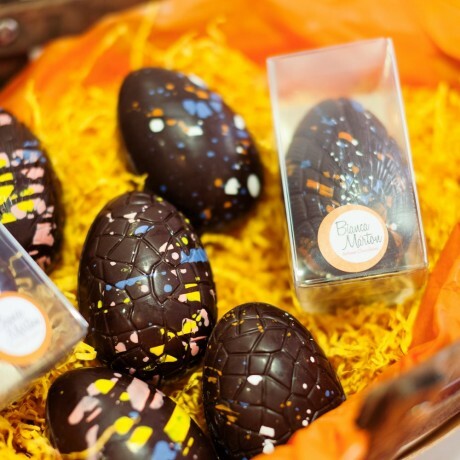 Beautifully packaged mini eggs and very tasty too! My son and daughter in law very much enjoyed their vegan egg and said it was very pretty too. Bought as an Easter present for my partner and it was very well received. It didn't even make it to Easter! The 6 little praline chocolates were lovely too. These are my go to truffles for a treat, I cannot recommend them enough. Delicious, and a great service. 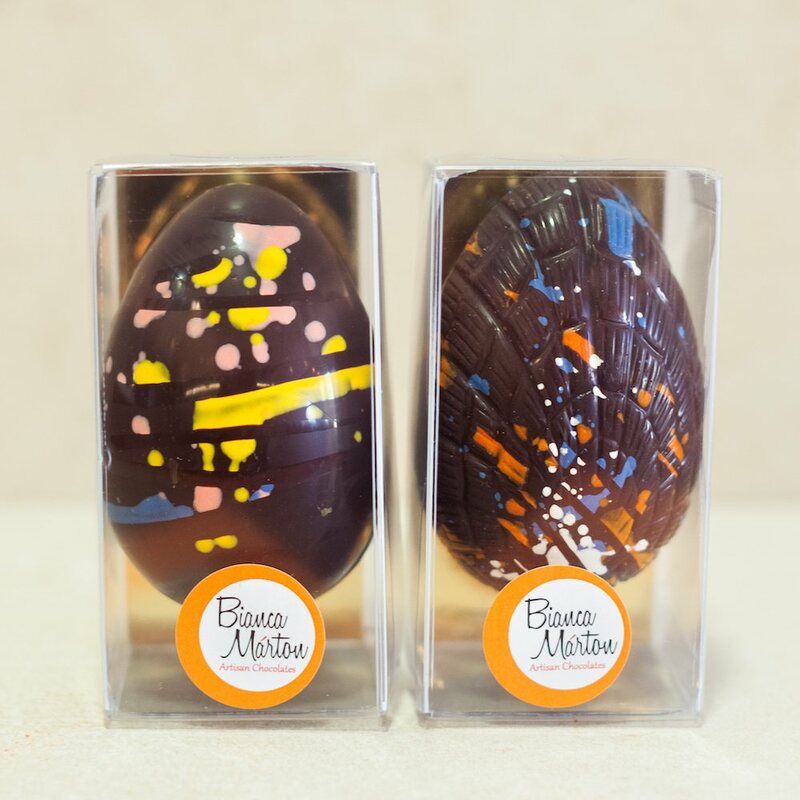 Minimum quantity for "Happy Vegan Chocolate Easter Eggs" is 2. Luxurious artisan chocolates created from 100% natural and animal product free ingredients.